The problem of comparing academic institutions in terms of their research production is nowadays a priority issue. 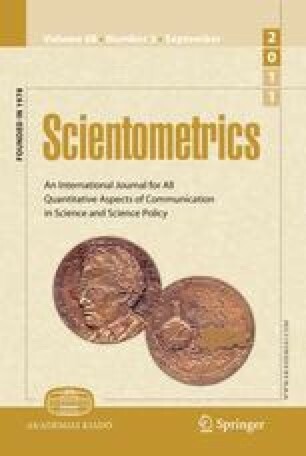 This paper proposes a relative bidimensional index that takes into account both the net production and the quality of it, as an attempt to provide a comprehensive and objective way to compare the research output of different institutions in a specific field, using journal contributions and citations. The proposed index is then applied, as a case study, to rank the top Spanish universities in the fields of Chemistry and Computer Science in the period ranging from 2000 until 2009. A comparison with the top 50 universities in the ARWU rankings is also made, showing the proposed ranking is better suited to distinguish among non-elite universities. Jose García Moreno-Torres is currently supported by a FPU grant from the Ministerio de Educación y Ciencia of the Spanish Government. The authors would like to thank Nicolás Robinson García for reviewing the manuscript. Dill, D. D., & Soo, M. (2005). Academic quality, league tables, and public policy: A cross-national analysis of university ranking systems. Higher Education 49, 495–533. doi: 10.1007/s10734-004-1746-8. Elsevier B.V. Scopus. (2010). See http://www.scopus.co. Accessed Oct 2010. ISI Web of Science. Science Citation Index. See http://isiknowledge.co. Accessed Oct 2010. Leydesdorff, L., & Opthof, T. (2010). Normalization, CWTS indicators, and the Leiden Rankings: Differences in citation behavior at the level of fields. http://www.leydesdorff.net/reply2cwts/reply2cwts.pd. Accessed Oct 2010. QS World University Rankings. (2010). http://www.topuniversities.com/university-rankings/world-university-rankings/hom. Accessed Oct 2010. SCImago Institutions Rankings. (2007). http://www.scimagoir.co. Accessed Oct 2010. Shanghai Jiao Tong University. ( 2009). Academic ranking of world universities (ARWU). http://www.arwu.org/index.js. Accessed Oct 2010. Universiteit Leiden. (2010). Leiden university rankings. http://www.socialsciences.leiden.edu/cwts/products-services/leiden-ranking-2010-cwts. Accessed Oct 2010.